MOLA-YUDEGO B, PELKONEN P. 2011. Pulling effects of district heating plants on the adoption and spread of willow plantations for biomass: the power plant in Enköping (Sweden). 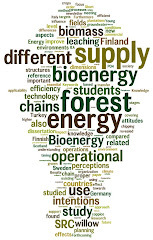 Biomass and Bioenergy 35(7):2986–2992. The development of the willow cultivation for bioenergy in the municipality of Enköping was analysed, with special attention to the changes in the capacity and use of wood fuels of the municipality’s combined power and heat plant, during the period 1986–2005. The evolution is compared with the municipality of Örebro, in Central Sweden, a pioneer in the use of willow plantations. The study was performed including the geographical location of all the plantations and owners using a GIS platform, and a methodology based on n-sigmoidal curves was proposed to study the adoption curves of willow before and after the changes in the district heating plant. The results show significant enlargements of the area planted with willow observed after the enlargement of the plant in 1994; most of these new plantations being located within 30 km from the plant. The method applied seems to be suited to explain the effects in adoption of the power plant. Around 28% of the growers seem to be attributed to the effects of the plant. The results of this study provide empirical evidence of the effect of the district heating systems on the development and promotion of willow plantations. The methodology provided can be valuable in understanding the success or failure of the energy programmes, from the farmer’s perspective, and can aid policy makers in achieving their goals. ► In this study we model the adoption of willow in Enköping and Örebro during 1986–2005. ► About 28% of the growers are attributed to changes in the district heating plant capacity. ► Adoption curves are a valid method to analyse the demand role on the spread of willow.